Bundled with Space Quest: Chapter I - The Sarien Encounter & Space Quest III: The Pirates of Pestulon. DOSBox version is also available (when using GOG Galaxy). An online browser version is also available. 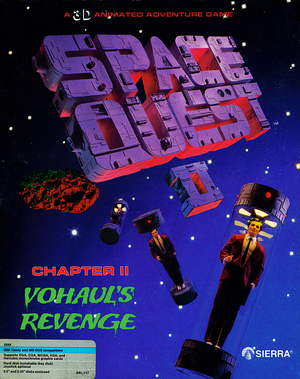 A compilation pack containing the entire Space Quest series. All games in the pack are pre-configured to run with DOSBox. A complete and free remake of the game, it adds new VGA style graphics, dialogue, a mouse driven UI, and a complete soundtrack. An alternative launcher for the Steam version of Space Quest Collection. It allows for both versions of Space Quest: Chapter I - The Sarien Encounter to be launched through the same launcher, and some minor UI and quality-of-life improvements. It also fixes launch issues with the VGA remake of Space Quest I that were present in the legacy launcher. It can be downloaded from the series Steam Community Discussions. 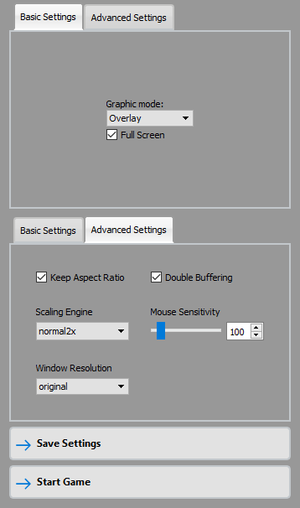 Toggle with Alt+↵ Enter (when using DOSBox or ScummVM). For DOSBox set in the DOSBox configuration file. The keyboard is needed to access the pause menu. Requires a 64-bit build of ScummVM. ↑ 2.0 2.1 File/folder structure within this directory reflects the path(s) listed for Windows and/or Steam game data (use Wine regedit to access Windows registry paths). Games with Steam Cloud support may store data in ~/.steam/steam/userdata/<user-id>/10110/ in addition to or instead of this directory. The app ID (10110) may differ in some cases. Treat backslashes as forward slashes. See the glossary page for details. This page was last edited on 27 March 2019, at 23:32.